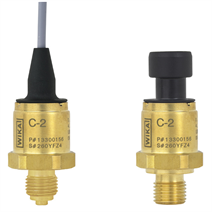 The model C-2 pressure transmitter has been designed for use in air compressors and compressed air stations. With measuring ranges from 0 ... 6 to 0 ... 60 bar, it covers almost the entire spectrum of currently available power classes for air compressors. The high demands that are placed on its robustness by these applications, are fulfilled without a problem by this pressure transmitter. This instrument features a vibration resistance of 20 g (in accordance with IEC 60068-2-6) and wetted parts that are suited to compressed air and lubricating oil. Specific process connections for the compressor industry enable a simple installation every time, even if the pressure transmitter cannot be mounted directly onto the compressor.